Indaba now serves hearty toast. Get your coffee and toast, too, at the sixth and newest location for Indaba Coffee Roasters. The newest store for the local roasting operation opened its doors in early September at a newly remodeled space in the heart of downtown, next door to Dodson's Jewelers and diagonally across the street from the Bank of America building. While Indaba is known and loved by locals for its signature roasts, community-driven mission and less-mainstream espresso drinks (we're thinking of its orange maple latte), the newest iteration is branching out to include something new: artisanal toast. "I'm excited to expand the menu into more of a well-rounded cafe-like setting," says Indaba owner Bobby Enslow, who adds that the bright and open space has been a few years in the making. "The main focus is inspired by the Mill [bakery and roastery] in San Francisco, an elevated artisan toast menu, and not just like one avocado toast. It's a whole menu of fun toppings, and sweet and savory options," he continues. The toast offerings are heartier (but just as hip) as they sound. Made with ultra thick slices of bread baked just across the river at Alpine Bakery and by regional newcomer Glorious Breads, sweet options ($6.75 each) served during opening week included house smoky peanut butter with spicy jelly, house butterscotch spread with black salt and chocolate shavings, and honey-sweetened ricotta topped with Green Bluff peaches. On the savory side ($6.75-$7.75 each), choose from a housemade lentil hummus with fresh cilantro oil, house bacon peanut butter with sriracha, bacon avocado with radish, cilantro puree and garlic mayo, or a mushroom pate with feta, roma tomato and radish green pesto. 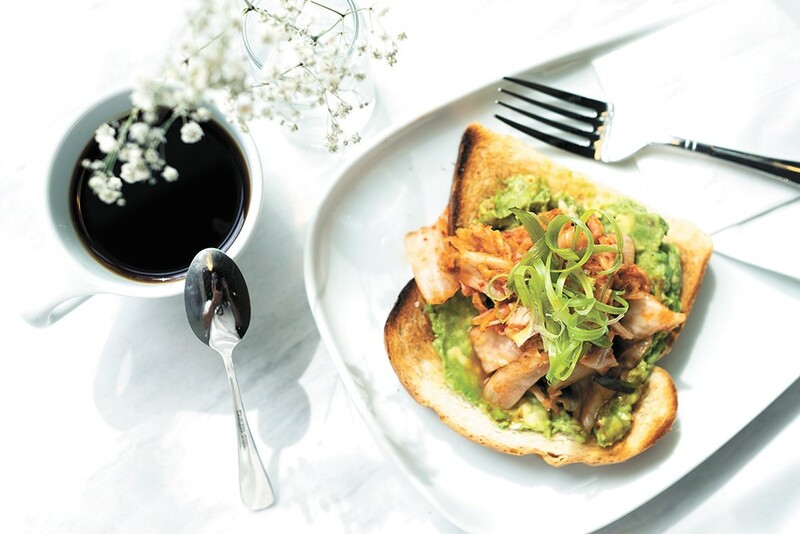 Enslow's special kimchi avocado toast is also a rotating special. Any toast order can be made vegan, gluten free or topped with a hard-boiled egg for a small upcharge. Indaba's toast lineup was created by chef Andrew Larson, formerly of Central Food, and a longtime friend of Enslow and his wife, Sheena. As time goes on, the plan is for Larson to experiment and introduce more food options beyond toast. Indaba's full espresso bar lineup is also served, along with tea, matcha, chai, craft sodas, cold brew and drip coffee. Starting soon, the location will also serve wine and beer on eight taps, expanding its hours into the weekends and later evening. Enslow plans to serve cold brew nitro coffee and even iced lattes, on tap. Customers looking for a quick cup to go can order drip coffee and tea from a self-serve kiosk at the front of the space. The new location also allows Indaba to debut its new Seraphim brand pour-over system, programmable slow-brewing equipment used to brew a selection of higher-end coffee and tea. "This is a unique thing we're doing with the coffee side, and a lot of that is in effort to free up baristas to engage in espresso and milk prep and food prep, and an effort to free them up for better engagement," Enslow explains. Though this location is only about two blocks from Indaba's smaller Howard Street cafe, Enslow says he sees this spot as serving different customer needs, with expanded seating, a private, rentable boardroom space, and coworking-friendly tables in the back half of the cafe. The original print version of this article was headlined "Success at Six"